The inaugural session of the summit would be attended by Ivanka Trump, daughter and advisor to US President Donald Trump, and around 1,500 delegates from across the world. Delegates have started arriving for the three-day Global Entrepreneurship Summit which begins in Hyderabad on Tuesday evening. The summit, which is expected to be attended by representatives of nearly 150 countries, will be inaugurated by Prime Minister Narendra Modi after he flags off the Hyderabad Metro Rail at Miyapur station. The inaugural session of the summit would be attended by Ivanka Trump, daughter and advisor to US President Donald Trump, and around 1,500 delegates from across the world. Following the inauguration, scheduled for 4.30 pm, Telangana Chief Minister K Chandrashekar Rao and Ivanka will address the gathering. Later, many of the VIP guests would proceed to Taj Falaknuma Palace for a dinner hosted by the Prime Minister. On Wednesday, Ivanka would be interacting with entrepreneurs during four sessions. The Hitec City area and Hyderabad International Convention Centre, where the event is being organised, have been turned into a fortress with nearly 10,000 security personnel, including commandos, special police, and civil police guarding the roads, hotels and the venue. 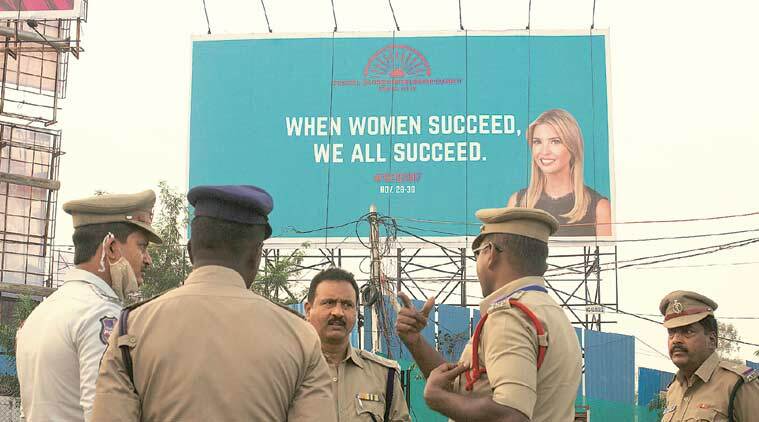 Security rehearsals were conducted Sunday and Monday at Begumpet and Shamshabad airports where Modi and Ivanka, respectively, will arrive Tuesday. Officials said Ivanka is expected to arrive in the early hours of Tuesday. City police officials said that if she decides to visit Charminar or shop at the famous bangles bazaar, they have made security arrangements. Approximately one-third of the entrepreneurs are from the US , one third from India and the remaining from other countries. Women will represent 52.5 per cent of entrepreneurs, investors and ecosystem supporters at GES 2017, the theme of which is Women First, Prosperity for All. This is the first time that women will be the majority of participants at GES. Women from 127 countries are participating in the event. More than 10 countries will be represented by an all-female delegation — including Afghanistan, Saudi Arabia, and Israel. Chanda Kochhar, MD and CEO ICICI Bank Ltd; Cherie Blair, Founder of Cherie Blair Foundation for Women; Ola co-founder Bhavish Agarwal; Deep Kalra of Makemytrip.com are some of the prominent names set to attend the summit. Miss World Manushi Chillar, actors Sonam Kapoor, Aditi Rao Hydari, and sports stars Sania Mirza and Mithali Raj may attend some events. The eighth annual GES is being hosted by the NITI Aayog in partnership with the US government. This is the first time GES is being hosted in South Asia and the event will highlight India’s enabling environment for innovation and entrepreneurship — including actions by the government to increase the ease of doing business, eliminating unnecessary regulations, and supporting start-ups, a statement from GES said, adding that the summit will primarily focus on Energy and Infrastructure, Healthcare & Life Sciences, Financial Technology & Digital Economy, and Media & Entertainment sectors.